Do you have patients with treatment plans that have not yet scheduled an appointment and want to see who these patients are in one place? You may be missing out on many production opportunities and aren’t even aware of it. Hint: these patients might be afraid to schedule their appointment because of anxiety of being in the dental chair, not ready to commit to multiple appointments or a variety of other issues. These patients would be prime opportunities to present FirstFit as a solution for their veneer, bridge or crown cases. You can easily generate a list of patients to go after using Dentrix Office Manager! We’re here to talk you through the steps. These patients are listed under the Unscheduled Treatment Plans Report. You can select your own criteria and the type of report you’d like to generate, i.e. condensed or detailed. If patients are scheduled for other work not listed on the report will have an “S” next to their name. Patients who have an appointment on the Unscheduled List will have a “U” next to their name. If it’s blank (no “S” or “U”), then that means the patient has neither scheduled or unscheduled appointments set up. Below are the 9 steps to generating this report. In the Reports menu, go to Lists and click Unscheduled Treatment Plans. The below box will appear. 2. Enter the Report Date. The current date will always appear as the default. 3. Under Select Patient, select the range of patients to include. From and To select the starting and ending patient. If you want to select all patients, leave the default <ALL> in both fields. Be sure to select the status or statuses you also want to include in the report. Dentrix includes only patients with the selected statuses assigned in the Family File on the report. 4. 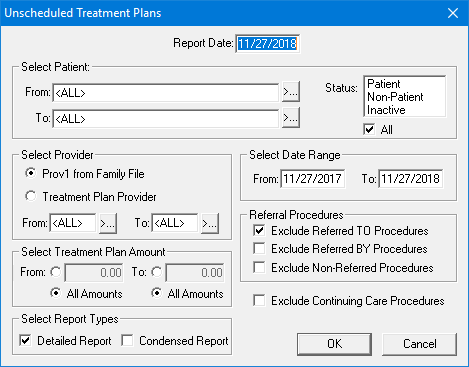 Under Select Provider, you can run reports by the patient’s default provider in the Family File by selecting Prov1 from Family File. You can also run reports by the providers assigned to the patient’s treatment plans by selecting Treatment Plan Provider. Select the range of providers in the From and To fields, or include all providers by leaving the existing <ALL> in both fields. 5. Enter values in the From and To fields to include only treatment plans with a specific value for the plan amount. To include all, select All Amounts. 6. Select whether you want to generate a detailed report, condensed report, or both under Select Report Types. 7. Type a date range in the From and To fields for the treatment-planned procedures. 8. You can exclude certain treatment plans from the report by selecting either Exclude Referred TO Procedures (procedures you referred to another doctor), Exclude Referred BY Procedures (procedures referred to your practice from another referral source), Exclude Non-Referral Procedures (all procedures except those who had been referred), or Exclude Continuing Care Procedures. 9. When finished, send the report to the Batch Processor by clicking OK. Schedule a 1:1 consultation with one of our Customer Success Associates to help you become more comfortable with the FirstFit System and help you look for the ideal FirstFit patient. Read the full Dentrix article here.